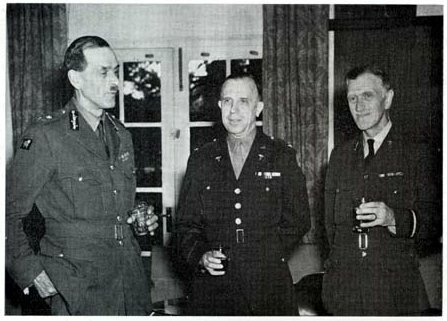 Major General Max Page, RAMC (left), and Air Commodore Geoffrey Keynes, consulting surgeon to the RAF (right), with Colonel Oramel H. Stanley, MC, at a reception and dinner given in their honour by General Hawley and his consultant group. Sir Geoffrey Keynes (pronounced “Canes”) was educated at Rugby School where he became friends with Rupert Brooke and was appointed literary executor for Brooke's estate on his death in 1915. He graduated from Pembroke College, University of Cambridge and then qualified as a surgeon with the Royal College of Surgeons in London. He served as a Lieutenant in the Royal Army Medical Corps during the First World War and then worked as a consultant surgeon, becoming an expert in blood transfusion. His work to create a portable blood transfusion device was recognized as saving thousands of lives during the First World War. His pioneering work on blood transfusion was the primary reason for his eventual knighthood. During the Second World War, Keynes was a consulting surgeon to the Royal Air Force. In 1944 he was promoted to the rank of acting Air Vice Marshal. He was a leading authority on the literary and artistic work of William Blake and was instrumental in establishing Blake as a central figure in the history of English art and literature. He also produced biographies and bibliographies of English writers such as Sir Thomas Browne, John Evelyn, Siegfried Sassoon, John Donne and Jane Austen. 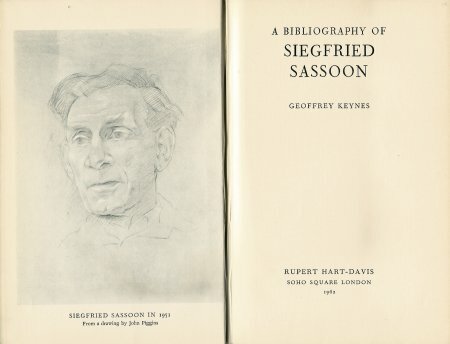 Right: A Bibliography of Siegfried Sassoon by Geoffrey Keynes, part of the Soho Bibliographies Series, published by Rupert Hart-Davis in 1962. In 1958 Geoffrey Keynes suggested to Siegfried Sassoon that his fame may be more firmly established by the publication of a bibliography of his writings. Wanting to protect himself from unwanted publicity, Sassoon was not immediately taken with the idea. However, it was not forbidden, and Keynes went ahead with the project. Keynes had inherited a large collection of Sassoon’s early work after the death of A.T. Bartholomew, friend of Sassoon and under-librarian in the Cambridge University Library. Keynes had also had a role in designing most of the volumes of Sassoon’s poetry printed after 1933 and therefore no-one was better situated to compile a comprehensive bibliography. Despite his initial misgivings, Sassoon began to collaborate via his library, scrap books and a very retentive memory. Information on the many periodicals in the bibliography was much more difficult to obtain. Publishers were contacted and an associate in New York worked hard to find copies of American editions and gather information about them. Many other people helped Keynes but as he states in his book, the bibliography undoubtedly has its imperfections, and for these he alone is responsible. Glancing through the pages on this web site we can see that many books were missed out (Not Collated), these are usually books such as anthologies, or periodicals to which Sassoon contributed poems. This by no means diminishes the great value of this reference book, but at the same time it establishes the main reason for the creation of this web site. One of the great things about collecting the books of Siegfried Sassoon is the range of editions available. However, although this is the case, many of the rarer editions are very expensive due to being limited, and in some cases signed, editions. 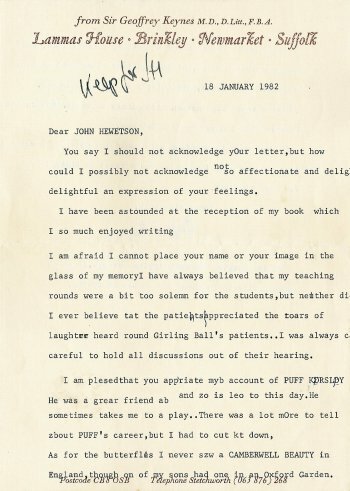 Right: Letter from Sir Geoffrey Keynes to Doctor John Hewetson dated 18th January 1982. (This letter was typed and contained many errors for which Sir Geoffrey apologises at the end). you say I should not acknowledge your letter, but how could I possibly not acknowledge so affectionate and delightful an expression of your feelings. I have been astounded at the reception of my book which I so much enjoyed writing. I am afraid I cannot place your name or your image in the glass of my memory I have always believed that my teaching rounds were a bit too solemn for the students, but neither I ever believe that the patients appreciated the roars of laughter heard around Girling Ball’s patients. I was always careful to hold all discussions out of their hearing. I am pleased that you appreciate my account of PUFF KERSLEY. He was a great friend and so is Leo to this day. He sometimes takes me to a play. There was a lot more to tell about PUFF’s career, but I had to cut it down. As for the butterflies I never saw a CAMBERWELL BEAUTY in England, though one of my sons had one in an Oxford Garden. 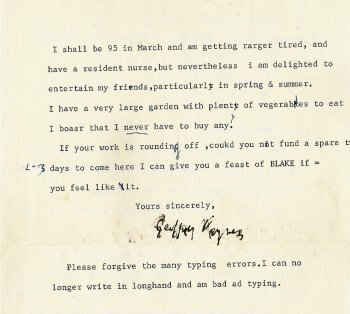 I shall be 95 in March and am getting rather tired, and have a resident nurse, but nevertheless I am delighted to entertain my friends, particularly in spring & summer. I have a very large garden with plenty of vegetables to eat I boast that I never have to buy any. If your work is rounding off, could you not find a spare 2-3 days to come here I can give you a feast of BLAKE if you feel like it. 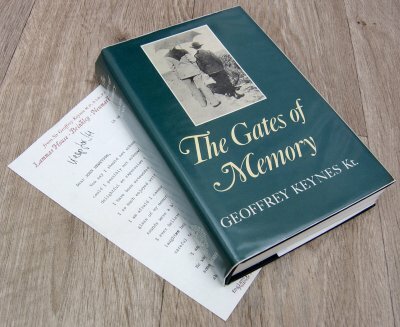 Sir Geoffrey Keynes published his autobiography, ‘The Gates of Memory’ in October 1981 when he was aged 94. He died the following year on 5th July 1982, aged 95. It has been my good fortune to be able to obtain two letters, one written by Sir Geoffrey Keynes himself six months before his death, and the other by his son Richard, writing about his father. The contents of these two letters are reproduced below, both of which were typewritten on headed notepaper and then signed in ink. The letters were sent to Doctor John Hewetson, who appears to have been one of Sir Geoffrey’s students. I do not think that I am breaking any confidentiality or invading the privacy of any of these gentlemen by detailing the contents of this correspondence. A great affection is shown by both Sir Geoffrey and his son, and implied by Doctor Hewetson. 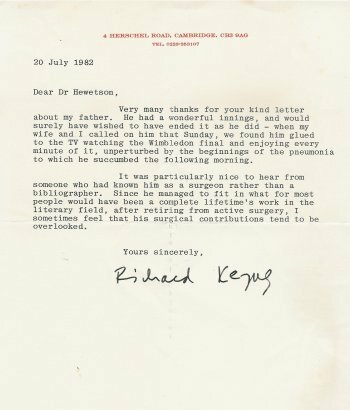 Left: Letter from Richard Keynes to Doctor John Hewetson dated 20th July 1982. Very many thanks for your kind letter about my father. He had a wonderful innings, and would surely have wished to have ended it as he did - when my wife and I called on him that Sunday, we found him glued to the TV watching the Wimbledon final and enjoying every minute of it, unperturbed by the beginnings of the pneumonia to which he succumbed the following morning. It was particularly nice to hear from someone who had known him as a surgeon rather than a bibliographer. Since he managed to fit in what for most people would have been a complete lifetime’s work in the literary field, after retiring from active surgery, I sometimes feel that his surgical contributions tend to be overlooked. 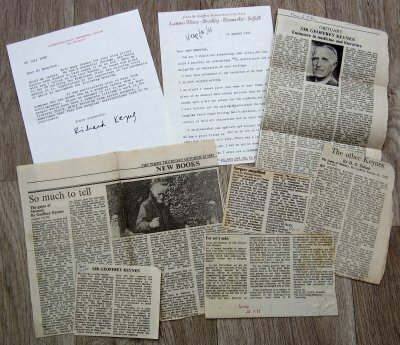 The two letters above came along with a number of newspaper cuttings (right). Book review, ‘The Gates of Memory’, The Times, 22.10.81. Book review, ‘The Gates of Memory’, no name of publication or date. Obituary, Sir Geoffrey Keynes, The Times, 6.7.82. Letter regarding omission of Keynes’ devotion to Blake in his obituary, The Times, 10.7.82. Letter from Michael Jaffe, Director, Fitwilliam Museum, Cambridge, regarding Sir Geoffrey Keynes’ bequest that his Blake collection should go to the Fitzwilliam Museum in lieu of capital tax liabilities, The Times, 28.3.85. Letter regarding Sir Geoffrey Keynes’ contribution to breast cancer teaching and practice, The Times, 28.4.87.